Our extremely low, modern long reach under-lifts manufactured by Ekebol Engineering. These under-lifts are designed to hydraulically reach under the front or rear of trucks / equipment to safely lift on springs or axles and tow. These systems are particularly useful for vehicles with low bumpers and fairings, there is no need to remove and refit these so it speeds up the recovery and repair process. Drive-shaft removal is recommended for all frontal towing to ensure the drive train is not affected. 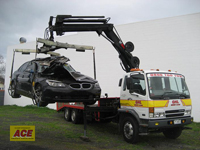 These systems have superseded the ‘pole towing’ method, which is unsafe and illegal in other countries. 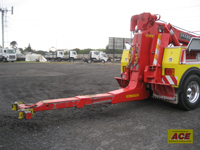 The hydraulically extendible booms provide an extra option to our recovery trucks and enable us to carry out controlled righting of a rolled over vehicle as well as lifting off barrier arms, tree stumps and out of drains etc. 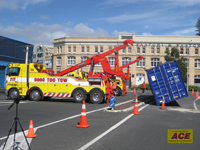 Our hydraulic booms are rated to lift a heavy vehicle off an object or put back on its wheels. 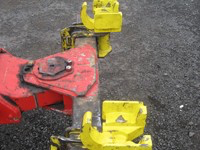 Our Recovery Trucks are fitted with powerful multi-winches, which are rated to winch 100 tonne plus to salvage a wide range of Trucks, Buses and other equipment in various situations. Wireless remote controls speed up recovery work and save time. High-pressure air mats are able to lift from 20-30 tonne enabling us to carry out ‘first-lifts’ on vehicles. We carry a wide range of air tools for quick recovery. 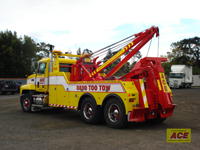 Recovery trucks are fitted with 5th wheel trailer attachments, which allow us greater flexibility when attending jobs. 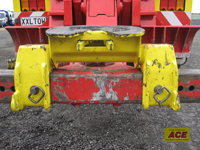 We have acrow-props for supporting damaged trailers while being recovered. All our trucks are equipped with a huge range of tools as well as a range of salvage straps, strops, chains, gas cutting equipment, lighting, spades, chainsaws, cones, spill grit etc for any scene we are dispatched to. Trucks are equipped with specialist Tour Coach and Bus lifting attachments. 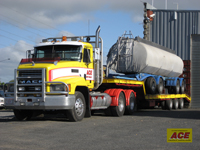 We have a heavy-duty low loader / tractor unit in our fleet to transport vehicles and other equipment as required. 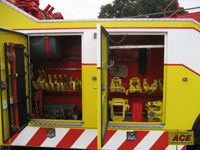 Our specialised 10 tonne transporter is equipped with a hi-ab for specialised assistance when required.